A stock broker or brokerage is licensed and regulated financial firm that facilitates buying and selling transactions in various financial instruments for investor clients, institutions and or for the firm. All financial market transactions have to be executed through a broker. Basically, a broker is responsible for facilitating all stock trades you place. Most brokers allow users to sign up through online applications. Brokers charge commissions for their services. The type of broker will determine how expensive and how the commissions are structured. There are three main types of brokerage firms: Full-service, discount and direct-access. Choosing which day trading broker to use is an important part of becoming a stock trader. There is not a specific company out there that is the "best day trading broker." The broker you choose should be relative to your needs as a trader. If you plan on trading options, you will want a broker that has good options pricing. If you plan on short selling stocks, you will want to find a broker that has a good short list. If you plan on scaling in and out of position, you may want to choose an online broker that has per-share pricing. Before rushing into choosing an online broker, make sure you know what your needs are. Focus on your trading strategy and find a broker that will help you meet your goals. Below are a few of the different types of brokers. These firms charge higher commissions or a percentage of assets. They offer the largest assortment of diversified financial services and usually assign a licensed individual broker to each client. These firms tend to have their own investment banking and research departments that provide their own analyst recommendations, products and access to initial public offerings (IPOs). Clients have the option of calling their personal broker directly to place trades or use various other platforms including online and mobile. Full-service brokers have physical offices and locations. They also offer financial planning, asset management and banking services. In addition to savings and checking accounts many full service brokers provide personal, business and home loans services. While most full-service brokers provide online access and trading functions, they tend to charge higher commissions and route orders directly to their own market makers or through order-fill agreements with other firms. Full-service broker online platforms tend to have less day trading tools and indicators as they cater more towards long-term investors. Discount brokers have narrowed the gap with full-service brokers in terms of financial products and services providing independent research, mutual fund access and basic banking products. As the name says, discount brokers have smaller commissions for trades. Usually the commissions will range for $9.99 to $4.99 per trade ticket, which may appeal to swing traders and less active day traders. The platforms tend to have more trading and research tools than the full-service brokers since they cater to active investors and day traders. Many of the larger discount brokers provide their own direct-access trading platforms and physical office locations throughout the country. Online brokers also known as direct-access brokers cater to active day trading clients with the smallest commissions often priced on a per-share basis, which is needed when scaling in and out of positions. These firms provide direct-access platforms with charting and routing capabilities with access to electronic communication networks (ECN), market makers, specialists, dark pools and multiple exchanges. Speed and access are the top benefits of direct-access brokers, often allowing for point-and-click executions and programmable hot-keys. Complex stock and options orders can be placed on these platforms. The heavy-duty platforms often carry a monthly fee composed of software fees and exchange fees. The software fees can usually be waived or discounted based on the client’s monthly trading volume. 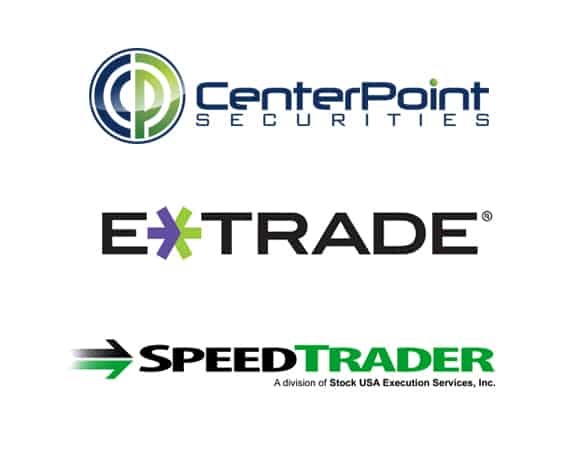 Active day traders are best advised to use reputable online/direct-access brokers to ensure maximum control and flexibility as well as speedy order fills. To keep overhead low and pass on the cheaper rates, online brokers usually don’t provide physical office locations for customers.